On this page, you will learn which rules apply to drone pilots in Chile. After registration, you will receive a registration card, which you should always carry with you in Chile. The registration is valid for 12 months and must be renewed afterward. Maximum Altitude: In Chile, your drone must not ascend above 120 feet (400 feet) above ground. Maximum horizontal distance and FPV: The use of multicopters in Chile is only possible within sight. 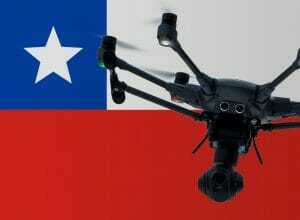 Compulsory insurance: In Chile, you are obliged to have drone insurance. Maximum take-off weight (MTOW): Up to a take-off weight of 750 grams is not required for private purposes registration with the DGAC, as long as you do not fly in the public / endanger anyone and not higher than all obstacles within a radius of 50 meters. Distance to airports: Your drone should not approach an airport closer than 2 kilometers in flight. Other safety distances: Unaffected persons must always be at a vertical distance of 20 meters and a horizontal distance of 30 meters. Operating hours: No restrictions known. Special rules: The operation of drones is prohibited if manned aircraft are used for firefighting at the specific location. Regulations for professional pilots: No specific rules known. Good to know: In Chile, you are required to deal with the current NOTAM before starting your drone. We have researched the listed drone regulations for Chile to the best of our knowledge. We cannot guarantee the correctness of the information. If you want to be on the safe side, contact the competent aviation authority. Alternatively, you can also ask the embassy in your country for further information about the regulations. Please leave us a comment when you receive news and/or gain experience with your copter in Chile! Hi, I’ve been thinking of getting a drone, specifically the DJI Mavic 2 Pro, however based on the rules for flying drones in Chile apparently the maximum weight is 750g and the Mavic 2 is over 900g. Do you know if the guidance has changed as the only one under the 750g regulation is the Mavic Pro but I don’t really want to buy the old version just to meet Chile’s requirements. I take it a 900g drone will absolutely not be allowed? I mean could I still bring it into the country or would they confiscate it at customs? Very many thanks. I’m from Chile. Don’t worry, they won’t confiscate your drone at customs. You can also fly it anywhere without a problem, just make sure to not bother people in general and don’t do anything stupid and you’ll be fine. Hi sorry I just saw your reply. That’s good to hear I am already in Chile and making my way up to San Pedro de Atacama for a few days so I hope to use it out there in some of the locations. I hope it’s not s problem there. Im going to be traveling to chile and November and would like to bring my Mavic pro over. It weighs (734g) which is under the maximum requirement. I want to make sure its ok to bring it. I dont want to go there and have customs take it from me. Does anyone know or have any recent experiences about this? I am planning to go skiing in la parva, valle nevado and/or el colorado in June 2018. Will it be a problem operating my Phantom 4 pro on the slopes ? Thanks for sharing this publish. I’m going to Atacama on Feb-19. I’ve been told that I can’t shoot only in the roads, not inside the parks. Do you know if that’s true?? Yes, Im wondering too, it seem too complicated to fly in Chile, are they that strict with drone laws? Did you manage to shoot at Atacama? I will be going there in two weeks and I consider taking my Phantom 4 Advanced. I would appreciate any advice or suggestion. Thank you. Guys, If I fly a drone like tello or dobby, they have less than 250g, how the law is applied?